Movie Review: The fourth adventure of the Jurassic franchise was given the name of “Jurassic World”, and basically presents us with what we already know, bearing some more visual flourishing on top of a flimsy plot. With no relation with the past installments, the story takes place at a dinosaur-theme park located on the Isla Nublar. Two unintimidated teenage brothers visit their extremely busy aunt, Claire Dearing (Bryce Dallas Howard) who happens to be the park’s operations manager. What should have been an agreeable trip of discovery and amazement, becomes a battle for survival, when a breach was detected in the tight security system, setting free an extremely dangerous, highly intelligent, genetically hybrid creature that has been raised in captivity and kills whatever crosses its path just for sport. 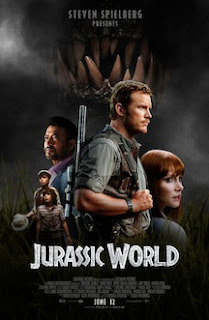 If there’s someone who can deal with the situation is the dinosaur expert and trainer, Owen Grady (Chris Pratt). However, his ability to minimally control other dinosaurs reveals to be inefficacious with the unpredictable creature baptized by the geneticists as Indominus Rex. In order to rescue her nephews who were at the wrong place at the wrong time, the obtuse Claire, who refuses to lose her charm by taking off the high-heels under threat, joins efforts with Owen in order to hunt the beast. If the raptors, including flying and aquatic versions, were not enough to deal with, there’s also the lab’s security’s header whose intentions are not noble. Despite some elaborate scenes, I felt they were not so diversified as they could be, limiting the fun. In addition to this fact, the plot is just another narrow creation packed with all types of creatures, standardized humor, and situations that never excelled. Moreover, director and co-writer, Colin Trevorrow, didn’t make me forget Spielberg (executive producer at this time), and the same happened to Pratt when compared with Jeff Goldblum.